In the heart of Durham’s Central Park District thrives an adult playground. A fun crawl, if you will. A square city block where one can throw an ax, relive retro arcade games, jam to live music, compete at bocce, and relax at one of the city’s most notable breweries. Sprinkle in a few restaurant choices, and it’s a one-stop Lyft to a fun day or evening. Urban Axes 619 Foster St.
Arguably the most popular draw due to its novice premise of chucking axes at large pieces of plywood while drinking alcohol. Sounds wrong, doesn’t it? In person, everyone is safely experiencing a unique, fun way to commune with friends/coworkers. Book ahead for groups (min 6 people) or take your chances during walk-in hours which are available Tu-Sun and sell out quickly. Plan to spend two hours or more for your ax-throwing experience. Click here for FAQs and pricing. Boxcar Bar + Arcade 621 Foster St. Need a lighter activity than throwing axes? Head next door to Boxcar Bar + Arcade. Raleighites will be ultra familiar with this Durham location of the barcade we all know and love. Featuring over 70 arcade games, the Durham location is much larger (no squeezing through pinball machines), serves woodfire pizzas, and offers a private event space. Yes, there’s still free popcorn! Motorco Music Hall 723 Rigsbee Ave. Walk to the corner of Geer St. and Rigsbee Ave. to enjoy the large outdoor and indoor spaces of Motorco Music Hall. Part bar/restaurant and part event venue, Motorco provides the opportunity to chill outside with eats and drinks or head into The Showroom for the night’s entertainment. Check out their robust event schedule here. Fullsteam Brewery 726 Rigsbee Ave.
Diagonal from Motorco sits Fullsteam Brewery. A pioneer of the Triangle brewery scene and veteran resident of Rigsbee Ave., Fullsteam remains a popular destination for community, games, and of course, great beer. Fullsteam also offers food pairings–we were particularly intrigued by their Girl Scout Cookie pairing special–and hosts a variety of events throughout the week. Surf Club 703 Rigsbee Ave.
Continue to the corner of Rigsbee and W. Corporation to Surf Club. 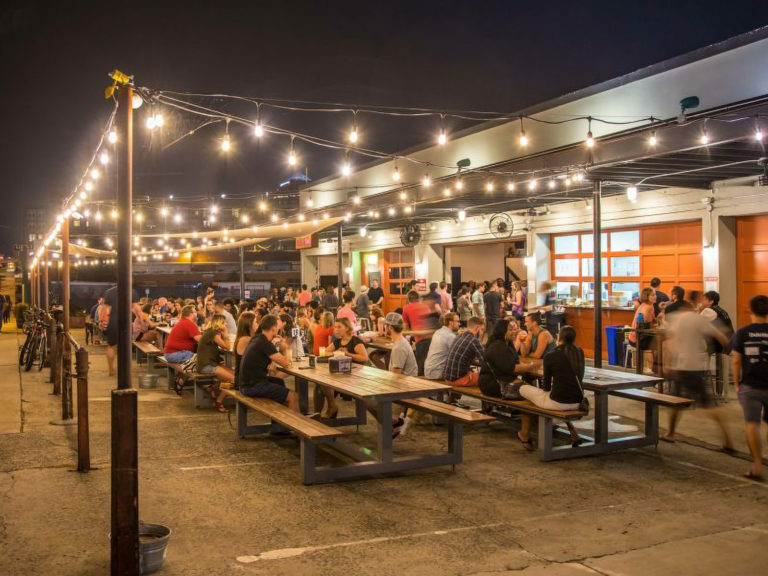 A great option for anyone looking for a laid back “dive” atmosphere touting an awesome outdoor space complete with bocce courts, shuffleboard, and food trucks. Circle back to Foster Street and you’re back at Urban Axes.